From Northern Saskatchewan to Northern Europe, three students in the Master of Northern Governance and Development (MNGD) program have gained valuable best lessons, models and practices from across the provincial north and the circumpolar world. Now, they will apply that knowledge to inform policy changes and regional development initiatives in remote Northern Canadian regions and the world. 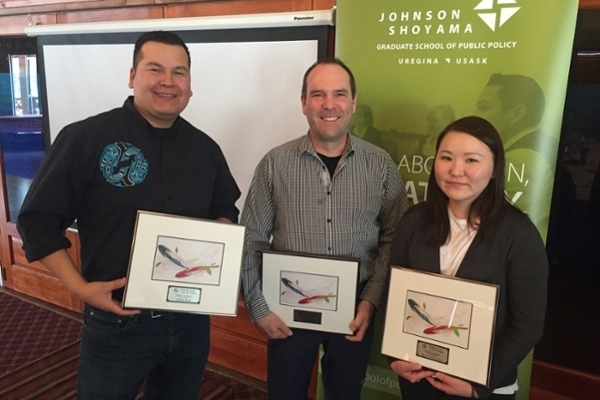 MNGD graduates, Simon Bird, Mariia Iakovleva, and Jim Searson were inspired by their own Northern and Indigenous upbringings to examine Northern economic and social development through a policy lens. They were presented with rich learning opportunities through coursework, international and northern field schools, and an internship. These experiences fueled their community-based research projects, from which they gained a multifaceted understanding of issues in the North. As a culmination of their learning and experiences, the group presented their community-based research at the Knowledge Sharing Showcase in La Ronge in April. The Knowledge Sharing Showcase was an excellent opportunity for the students to organize and exhibit their research in a community-based setting. Iakovleva came to Saskatoon from the Republic of Sakha (Yakutia), a Northern region of Russia, bringing valuable scientific and innovative project development experience and a background in philology, sociology, and sustainable development of the Arctic. Iakovleva’s research project, The Sakha Republic Case Study and Lessons from Alaska to Saskatchewan in Renewable Energy Development, was inspired by a case study from her home community in Russia. It demonstrated the impacts of energy subsidies in northern remote communities, while also highlighting the opportunities for renewable energy development. She also discussed her community-based research from Alaska, which provided examples for renewable energy development in Northern Saskatchewan communities. MNGD graduate, Simon Bird, has always thrived in his people’s traditional ways and has served as a teacher, a principal, liaison, Federation of Sovereign Indigenous Nations Vice Chief, coach and as a Superintendent of Education and now the Director of Education for the Lac La Ronge Band. Bird’s research topic, Telehealth and the Impacts on Remote Northern Saskatchewan, explored the reality of the current Northern health system and how technology can improve lives in the North. Jim Searson was born and raised in La Ronge and remains in the small Northern community with his wife, Chief Tammy Cook Searson. He presented his research, Exploring Capacity Building for Northern Saskatchewan Youth through the Junior Canadian Ranger (JCR) Program, which investigated the potential community and capacity building benefits of establishing a JCR patrol for Northern Saskatchewan. He believes that the Junior Ranger program could develop both Ranger and life skills along with First Nation traditional skills, culture and language – all of which could change the narrative and path for the positive development of youth in northern Saskatchewan. On June 5, these three MNGD graduates, along with 22 Master of Public Administration, five Master of Public Policy, and two Ph.D. in Public Policy graduates, joined over 800 JSGS alumni worldwide at the University of Saskatchewan’s Spring Convocation. 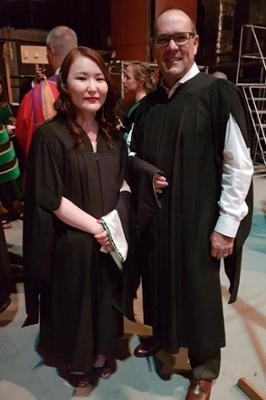 The following day, on June 6, 20 MPA, 19 Master of Health Administration, and 15 Master’s Certificate crossed the stage at the University of Regina’s Spring Convocation.